Summer is heating up, but we've got you covered with Part 3 of our Bikini Body 2016 series (if you missed them, here is Part 1 and Part 2). This time, we reviewed the Ultrasound Cavitation treatment and Presor Therapy treatment at the well-reputed Glow Spa in Hong Kong. Me and the boyfriend working off our breakfast in Bali. What is Ultrasound Cavitation and Presor Therapy? Ultrasound Cavitation therapy involves applying a machine that sends low level ultrasound waves into specific parts of your body, which creates micro bubbles that disrupt the walls of fat cells. The fat cells then implode, turning into liquid, which is then drained out naturally through your lymphatic system and through your urine. The treatment does not require any anaesthetics or surgery, and you are able to go back to your daily routine immediately with no down time required. Presor Therapy is similar to a deep body massage, designed to increase circulation and lymphatic drainage and reduce cellulite by compressing certain parts of the body when wrapped in a sleeve that is fitted with airpumps. The compression applied to your body is supposed to encourage oxygen to flow into your tissues, improving blood circulation and releasing lactic acid build up, which is great for athletes and airline crew. There aren't too many stipulations about what to do before the Ultrasound Cavitation treatment, aside from not eating two hours before (or after) the treatment, and consuming a significant amount of water in the day or two before you visit the spa. Glow recommends consuming a low-carb meal after the treatment; and naturally, a lower calorie eating regime will probably help if your goal is to slim down / look more toned. I tried the Ultrasound Cavitation treatment first. My lovely therapist Lily guided me to a room where I explained that I mainly wanted to focus on toning the stomach and back of my thighs. She quickly came up with a plan of attack: she would use the machine for around 15 minutes on my stomach, and then 15 minutes on each leg, finally rounding off with a manual hand massage on the back of my thighs to stimulate the removal of the toxins through my lymph nodes. After stripping down to my underwear, Lily applied a cooling gel to the head of the applicator, and began spreading the gel over my abdomen. Given that I apparently don't have an excessive amount of fat around my stomach (her words, not mine), she asked me to turn onto my side so that she could gently pull my belly rolls (my words, not hers) so that the machine could have access to my fat deposits more effectively. For clients who carry a bit more weight around their midsections, they are able to simply lie down on their backs without having to lie on their side. Lily told me that I might hear occasional noises while the treatment was underway, and that this was normal. She was right: it wasn't long after she turned on the machine and began massaging my stomach with the machine's applicator that I heard what sounded like a shrill cicada calling out in my head. It was an odd sensation, because it was clear that the sound was coming from within me, rather than outside, so I was "hearing" it in my mind rather than my ears. The sound was intermittent and random - there would be times where 20 seconds would pass and I wouldn't hear anything, and then times where there would be constant chirping. The noise might be unnerving to those who are sensitive, but I found it completely acceptable. What was slightly uncomfortable was that the applicator became quite warm (or perhaps it was my skin), so I was grateful for the initial cooling gel that Lily applied. She then got me to roll over onto my front so she could work on the back of my thighs, where the chirping noises in my mind became louder and more persistent. I had become accustomed to the heating up of the applicator though, so this part went by quite quickly and without discomfort. Better yet, the lymphatic drainage massage that Lily gave me with firm downward strokes along the back of my legs afterwards was bliss (and much better than the painful ones I've had at some Chinese massage parlours!). I was then lead to another room for the Presor treatment, which involved being strapped into what felt like a human-shaped tent from the hips down. The suit was then pumped with air from the machine at different rates, tightening slightly around me so that I felt warm and secure, before releasing slightly. So warm and secure, in fact, that I fell asleep! After around 45 minutes, I stepped out of the suit feeling completely relaxed and reinvigorated. As is always the case in Hong Kong, packages are offered that will lower the cost per session. A cavitation slimming treatment (which includes both ultrasound cavitation and 30 minutes of presor therapy) at Glow costs HK$980 for a single session of 60-75 minutes, although the first trial is only HK$680. A course of 10 treatments will cost HK$6,800 for one area (for example, upper arms) and HK$9,800 for two areas (for example, thighs and upper arms, which will be 75-90 minutes). The presor therapy by itself costs HK$600 per 60 minute session, or you can buy a course of 10 sessions for HK$4,000. 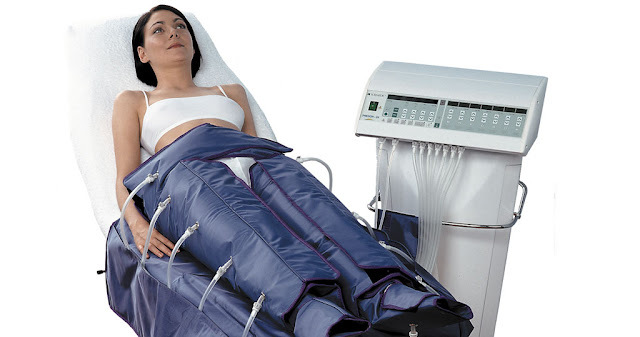 The Presor treatment is quite similar to the Dermology treatment offered by Hypoxi that I reviewed here, except that Glow clients usually only use the suit from the waist down (whereas the Dermology suit was a full body one). I felt that the Presor treatment was more relaxing (and great for those who want to have a nap and wake up feeling re-energised); but again, given that it is not designed to assist with fat burning, I'm less inclined to buy a full package course of treatments. The Ultrasound Cavitation, on the other hand, is something that I think has potential. From anecdotal evidence, it appears that this treatment is more effective for those who have stubborn fat deposits in certain areas (hello, lovehandles! ), but is not appropriate for those who are obese and looking to miraculously drop dress sizes in a short period of time (surgery is probably the only realistic option for that). Glow recommends that you do eight to ten treatments, going in at least once per week. Having only done a one-off trial treatment, it is, frankly speaking, hard to tell how much direct impact it had on my body, but I did notice that a few days after my treatment, I was looking leaner and more toned. Be advised though, that you probably won't see results until you have done at least four treatments. Finally, remember that you are encouraged to drink as much water as possible after your Ultrasound Cavitation treatment in order to flush out the liquified fat, and not to consume food two hours after your treatment. No alcohol is allowed for two days after your treatment either, as your liver is supposed to be working overtime to help remove any toxins from your body. PS. Special thanks to the lovely Sioban and Lily at Glow for allowing us to trial both treatments on a complimentary basis.